Phototropism (pronounced foe-TA-tro-piz-em) is the growth of a plant in the direction of its light source. Plants are very sensitive to their environment and have evolved many forms of "tropisms" in order to ensure their survival. A tropism is the growth of a plant as a response to a stimulus, and phototropism occurs when a plant responds to light by bending in the direction of the light. Although plant physiologists (scientists who study how the processes of a plant actually work) know that this growth is caused by a plant hormone, they still do not fully understand exactly how it works. windows but rather because light is essential to their survival, and they have developed ways of making sure they get all they need. We know then that it is the light coming through the window that the plants are striving to get closer to, but how is a plant, which is rooted in soil, able to "move" toward the light? Actually, the plant does not so much move toward the light source as it grows in that direction. As already noted, this growth of a plant that occurs as a response to a stimulus is called a tropism. There are several forms of tropisms, such as gravitropism or geotropism, in which a plant reacts to the force of gravity; hydrotropism, in which the presence of water causes a response; galvanotropism, in which a plant reacts to a direct electrical current; thigmotropism, in which a plant responds to being touched or some form of contact; and chemotropism, in which a plant reacts to a chemical stimulus. Since the prefix "photo" refers to light, phototropism involves a plant responding to light. 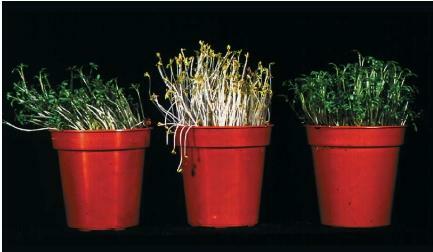 In all of these tropisms, the plant's response involves some form of growth. Finally, all tropisms are either positive or negative, although these words are not always used. So when a plant's leaves grow toward the light (stimulus), it is technically called positive phototropism. When its roots normally grow away from the light, it is called negative phototropism. Auxin: Any of various hormones or similar synthetic substances that regulate the growth and development of plants. Photosynthesis: Chemical process by which plants containing chlorophyll use sunlight to manufacture their own food by converting carbon dioxide and water to carbohydrates, releasing oxygen as a by-product. Tropism: The growth or movement of a plant toward or away from a stimulus. It is known that as long ago as 1809, Swiss botanist Augustin Pyrame de Candolle (1778–1841) observed the growth of a plant toward the light and stated that it was caused by an unequal growth on only one part of the plant. However, he could not understand how this was happening. Some seventy years later, English naturalist Charles Darwin (1809–1882) began to grow canary grass in order to feed the birds he kept, and he eventually discovered that it was the tips of the sprouting seedlings that were influenced by the direction of their light source. He and his son Francis learned this when they covered the tips of some seedlings and found that they did not move toward the light. When only the seedlings' stems were covered, however, they still moved toward the light. It was not until the 1920s that Dutch botanist Frits W. Went (1903–1990) proved the connection between phototropism and a plant hormone called auxin. Went discovered that plants manufacture a growth stimulant (which he named auxin) in their tips, which they then send to other cells in the plant. In phototropism, however, this growth hormone is distributed unevenly when the light source comes from only one direction. Specifically, more auxin flows down the dark side, meaning that it grows faster than the exposed side of the plant. This unequal or one-sided growth (also called differential growth) brings about the curving or bending of the plant toward the light source. Went named this growth hormone after the Greek word auxein, which means "to increase." Although it was isolated and named, auxin was not understood chemically until twenty years later when it was finally identified chemically as indole-3-acetic acid. Understanding what plant tropism is and, specifically, what happens during phototropism makes us realize that plants, as living things, necessarily demonstrate the several characteristics of life. Specifically, this includes growth, response to stimuli, and adaptation. It is because of its hormones that a plant's stem always grows upwards and its roots always grown downward. Since plants must make their own food to survive (by changing light energy into chemical energy—a process called photosynthesis), the ability to capture as much of this light energy as possible is crucial to its survival. Thus, plants have developed a chemical response to light or the lack of it that causes their stems to bend toward the stronger light. Today, we know that a certain minimal amount of light (whether natural or artificial) has to be present for the plant to react chemically. This is called its threshold value. Despite our understanding of the basic stages and phases of phototropism, we are only now beginning to obtain the most basic knowledge of what goes on at the genetic and molecular level. We do realize however that plants are living, sensitive things that can adjust to their environment and actually seek out the light they need if they are not getting enough. This was a good site! I only looked at the pictures! has alot of awsome pix and good info... esspesially for ascience project. Great website, helped me alot with phototropism assignment, wickapidias is WAY to long and complicated. I will reccomend this site to others at my school. This information is also very interesting. I had no idea that phototropism had anything to do with a plant hormone. Great information and unlike other websites, i actually understand what i'm reading but it would be great if you could describe the other types of tropism a bit more. Thank you for all the help and great work! Wow! Thanks so much for such good information that was very easy to understand. I appreciate it very much! I can use this on my phototropism assignment and experiment! Thankyou! this website rocks!huge help with my project. this is great! this sit is gr8. Really help me understand it better. thanks for the info! it helped for my prac assignment. Good website. I needed this information for my science research papers. got my information off . really good site. :) And that says alot! this website is so good..
with all this info I can do my holiday assignment..
this is really an educational website. Omg this really helped me and my science project!!! Good information! I'm doing a project on how plants respond to light by being put at different points in a room, but my farthest plant away looks healthy, but I was expecring it to be the one to most likely lean the most towards the window. Any tips on the subject? I found this really helpful for my biology EEI. Anyone know what the chemical compitisition of indole-3-acetic acid? I used it for science project! Will acknowledge in science assignment bibliography. is it backed up by facts? thanks 4 the help! ill remember to use this cite more often! i realy like the arrangement and love the information given it has been realy helpful. Thank you so much. Thanks! This helped a lot with my Report!!! I got an A on it! Awsome info about phototrophism.It will be pretty helpful to my research project on Homeostasis. wow that was great i love the it help a lot for biology research!!! real good site it helped me on science project i love phototropism!!! This is a really great site. It helped me with my science fair report. However, maybe you could define a few more words that people may not know. This was a fantastic website that really helped me with my science fair project. I am studying how plants navigate objects to find sunlight. This website helped me to get a better understanding of phototropism. Thanks! Really useful for my Biochemistry assignment. love this. This website is very helpful. Thanks to it, I can now finish my Science Fair Project! Out of five stars, I'd give it five. Hands down one of the best! Very useful website with lots of info and good explations. I'll be using it for a science project.